These last couple days has been hectic!!! Because of the sudden severe cold front from Japan, the ocean has been crazy!!! Waves are huge and wind is strong. It has even been messing with the shore dives!!! 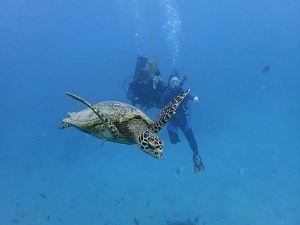 Recently at FishEye there has been a new turtle, a hawksbill, livingin the area. Pretty sure that somebody is feeding it… Please stop feeding it!!! 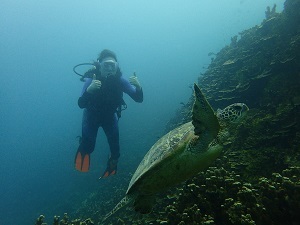 For the boat dive, we went to Gab Gab 1 since the ocean is not cooperative. We found a turtle and the customers enjoyed the day!! !